After several days of Fringe-going, when people ask you what your favorite show was, or what the best show you saw was, or the thing they absolutely cannot miss, I’ll be honest, my brain freezes up. Because it can all become this wonderful blur. There’s so much good stuff in the festival. So maybe your brain defaults to whatever the last thing it was you saw. Or maybe your brain defaults to all those expected shows - the offerings from the regulars on the Fringe circuit who come back again and again, and just seem to keep getting better all the time. I’m trying to be more deliberate than that now. I figure most other people are going to be in that blur with me. So I figure I can count on other people to mention the last thing they saw, and mention the expected shows. I’m trying now to reach back across the 22 shows I’ve seen in the first four days and pull out the shows I think they probably haven’t heard of, because the artists are either new or not local, or both. So right now, the three names I pull out when someone asks me “the question” about my Fringe this year so far are: The Gospel of Sherilyn Fenn, Write Me A Song, and Oh Snap! My Alien Children Are Trying To Kill Me. Why Oh Snap! My Alien Children Are Trying To Kill Me? For starters, there really isn’t a reason not to go. If you’re looking for a show that’s laugh out loud funny, but also serious, powerful, and moving, Oh Snap! My Alien Children Are Trying To Kill Me has all of that. 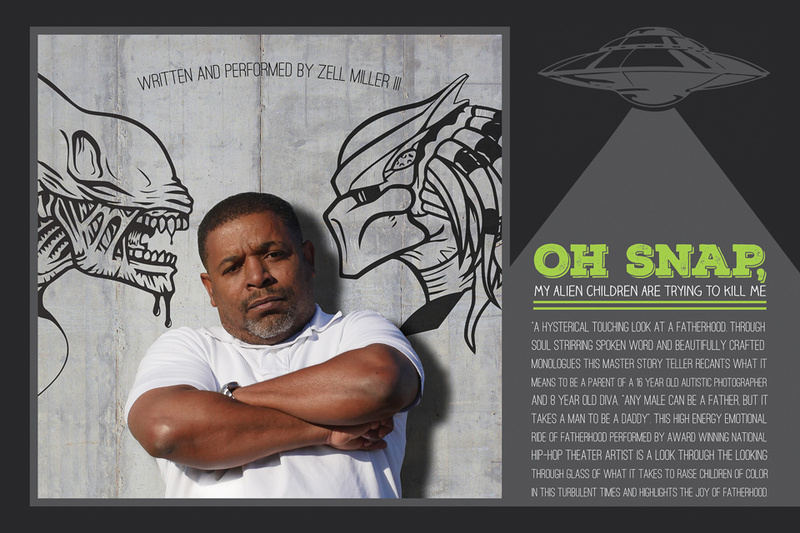 Zel Miller III, accompanied periodically by recordings of the people he loves - his two children, and the woman in his life - spins tales and spoken word anthems of fatherhood. The guy is a master wordsmith and a great comedian. But Miller’s not only an artist. He’s a man who’s worked for decades as an advocate for youth and a facilitator in a domestic violence shelter. He’s seen the struggles of others, but finds that experience doesn’t always prepare you for the challenges of child-rearing under your own roof. He delves into the strangeness of babies and small children in general, and also tackles the specifics of what it’s like to be a father to a boy or a girl, since he has helped create one of each. More than that, he talks about the specific challenges and fears of raising a young black man in a country that doesn’t seem to value young black men all that much. When sweet little boys become teenage boys, they get a lot harder to handle. Add to that the fact that his son is teenager on the autistic spectrum. If you’re familiar with the stories of Philando Castile, Trayvon Martin and Tamir Rice, you’ll hear echoes of their experiences here, too. There’s absurdity, laughter and tears - all of which come from a place of recognition. Anyone who has children of their own, or had other people’s children become a central a part of their lives, knows what Miller’s talking about. Miller’s frankness and honesty, combined with a wicked sense of humor, makes for a great solo show. Miller will work the whole crowd, but fill those seats right up front near the Bryant Lake Bowl stage. The more energy he can feed off of right in his line of sight rather than all the way at the back of the house, the better. Really, we should be filling the place. There are so many mediocre, or just plain bad and self-indulgent one person shows. When you find an artist who can hold the stage on their own, and really share a humorous, compelling human story, that’s Fringe gold. Everyone should be seeing it. That’s why when people ask, I bring up Oh Snap! My Alien Children Are Trying To Kill Me. See it for yourself. Then tell everyone else you meet.